It’s always interesting to watch what happens when cultures combine. For example, arranged marriages are common in some parts of the world. If you were from Pakistan and wanted to explain how marriages usually happen, how would you go about it? How about a board game? “There is that one aunty who is chasing around these three teenage girls, and the entire gameplay works by the draw of cards, so, essentially, the aunty would pick up a card that says, ‘You see a girl with childbearing hips and move four places closer to her,’ and so she moves closer. But then the girls on the other hand are drawing cards that would make them less appealing. So the girls will pick up a card that says, ‘You photoshop a picture of yourself with alcohol to trick the aunty. Move four spaces away,’ or, ‘You’re seen in public with your male friends,’ or, ‘You’re caught out on a date,’ and things that are very very normal elsewhere, but are seen as disgraceful in Pakistan. “It’s essentially this rat race where the girls are trying to run away from the aunty and the aunty’s moving closer to them. And as the game goes on, the aunty also comes across these eligible bachelors that are not really desirable at all, but she comes across them, like the ‘mama’s boy’ or the ‘womanizer,’ and as she has control of them, she can marry those boys off to these girls. “However, there is a little golden light at the end of the tunnel, namely, the ‘golden boy.’ He’s essentially the boy that every girl wants, the one that is every mother’s dream. He studied abroad, and he has a foreign passport, and he’s the CEO of a business and light-skinned, light-eyed, all those things — got the whole package. And so, when the aunty comes across him, there is a complete change in the game dynamic, and the girls then start to draw from this deck of cards called the ‘golden deck,’ and that’s when they start to flaunt their talent, such as the fact that they can make a perfectly round roti or the perfect cup of chai. Sounds like the perfect activity for that next family reunion! 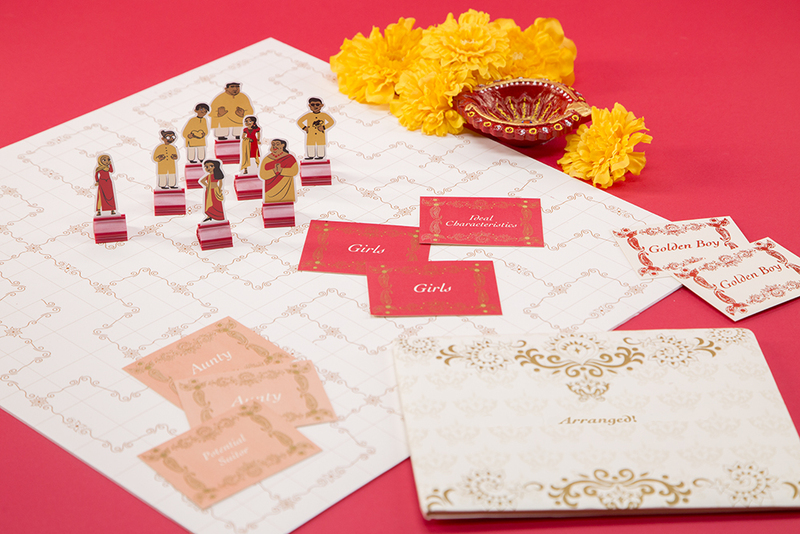 To read more about the game itself, visit http://nashra.co/#/arranged/ . The photo came from that site.